"If you don't want to be old, don't live" was the phrase of my son when old age pains were the subject of discussion at home. This made ​​me think that life is a series of adventures, where each of them are part of our life, that's why live with passion is so nice, because every minute is just as important as the other one. One of my passions curiously these days gained some notoriety in the Bolivian press, the economy of hydrocarbons, in particular, Government Take in oil and gasrevenues. For this reason, I want to share the story of the oil revenues before and after the hydrocarbons "nationalization" in Bolivia. I hope these words can help the debate and the reality abstraction I made will reflect what actually happens in my country. 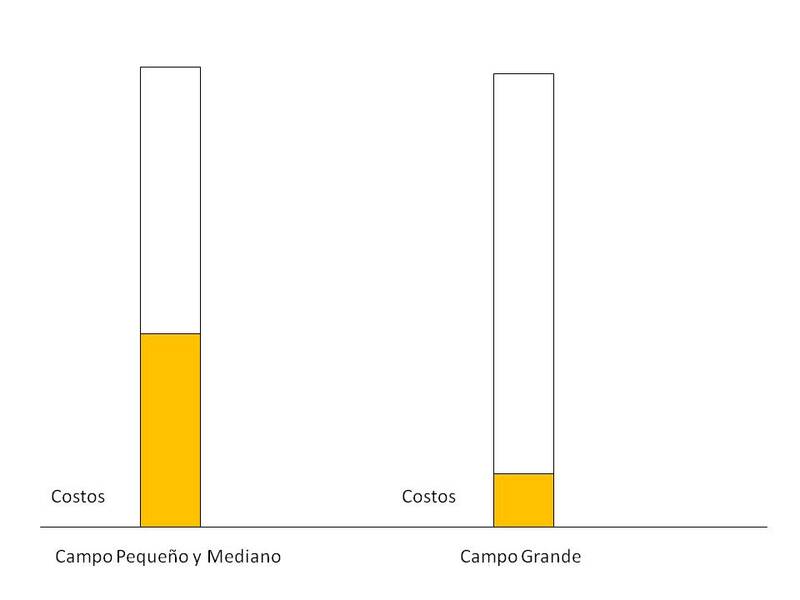 Well let's start; in the chart below I present the situation without taxes for two types of fields in Bolivia, to the left is the position of small and medium fields on the right the large fields, it is clear that the costs are different in both cases, then the fight is how to divide between government and private the remaining white area. In an effort to better visualize the situation, let me remove the white area, as I do below. As is clear, some fields in Bolivia could (and can) support this royalties and production tax, but for others the situation is unprofitable. In 2006, President Evo Morales Ayma, approved a supreme decree forced oil and gas companies to renegotiate exploration and exploitation contracts. Result of these negotiations, the State (through YPFB the national oil company in Bolivia) achieved an additional revenues, keeping the provisions of Law 3058 Government and oil companies negotiated around a table and agreed tables (different according to each contract) as which then attached as example. According this tables, the Government share is funtion of investment recovery (B parameter) and production level. Naturally in small and medium fields renegotiating contracts was less aggressive, as you can see in the left part of the previous figure. That's why for some people the Government Take is 87% and for others is 67%, the funny thing is that when the Government said it would exchange (through the nationalization) the previous division 18% (Goverment)-82% (Private sector) to 82% (Government) - 18% (Private sector) talked of percentage on gross income (on the left), but now seems to be talking of percentages in the right. Regarding the small and medium fields the IDH (32%) captured almost all of the oil and gas revenues, therefore, the percentages of nationalization were very small. But the percentages are very different, over the net profit the Government Take is 95%, but over the gross revenues is 51%... in fact, in many cases (especially oil fields) the Government takes the 100% of the profit (white area). For this and other reasons, the investment in small to medium sized fields or oil fields is almost nil. The problem in our country is the lack of progressivity of state participation in oil revenues. As I usually say, thinking that all the hydrocarbons sector can pay 50% of production taxes, it's like wanting all Bolivians have the same size suit (suit jacket and pants) to small people (like me) will be large, but with tall people will be small ... a progressive tax system is like to have a "tailored suit". My good friends, it has been a pleasure to share these ideas with you; I hope the political discussion of the moment (in Bolivia) can help to resolve the hydrocarbons problems in my country. We all like to harvest, but today it is time to sow... the challenge is raised and is in your hands. As I heard in a movie: "long life and wisdom for live it." La Paz, August 17, 2014. @César, my friend, agreed with you in all your comments. Thanks. Mauricio,as you clearly state the problem with the Bolivian oil and gas fiscal regime is the lack of progressivity. However the renegotiation of the E&P contracts also know as Nationalization is the only progressive element in the fiscal regime. Clearly Bolivia needs a new fiscal regime that preserve the royalties but eliminate the IDH. The introduction of a new progressive Resource Rent Tax (RRT) and the elimination of price control trough a policy of direct and focalized subsidies are the main issues that should and must be introduced in the legislation.